An unidentified man stole up to $100 from a woman trapped in her car after her Toyota collided with an SUV. The thief could have helped her, but he robbed her instead. 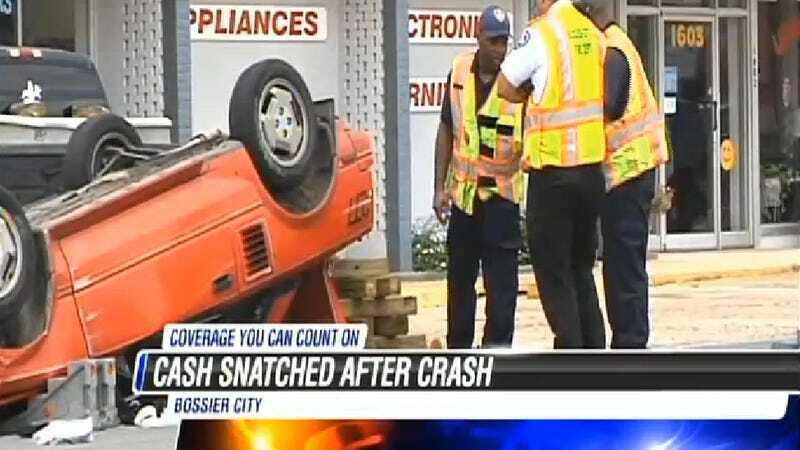 KSLA 12 News reports that early Monday afternoon in Bossier City, Louisiana, a woman driving a 1980s Toyota MR2 collided with a Chevy Tahoe pulling out of a dentist's office. The Toyota spun across an intersection and then flipped onto its roof. In the spin, around $200 flew out of the car. Witnesses told police that a man scooped up some of that money and then left, all while the woman remained trapped in her upside-down Toyota. The Tahoe driver was cited for failing to yield from a private drive. The woman was taken to LSU Hospital and treated for non-life-threatening injuries. If you happen to find this thief, please alert the authorities and resist the temptation to punch him directly in the testicles. KSLA 12 News reports he may face a misdemeanor theft charge. Car crash victim robbed while stuck in car. Some people are just dicks. Channel 12 KSLA has the story.